Prime Minister David Cameron has said he is "terrified" by the prospect of trying to find a good state secondary school for his children. Mr Cameron told the News of the World that, living in central London, he sympathised with parents in areas where there was no choice of decent schools. He has previously said he wants his children to attend state schools. The government has been criticised after announcing more than 700 school building projects would not go ahead. Mr Cameron has acknowledged that axing the school building projects, which was part of the previous government's Building Schools for the Future (BSF) programme in England, was not "easy" or "popular". But, writing in the Sunday Express, Education Secretary Michael Gove said the government would "continue to invest in school buildings". Meanwhile, in his News of the World interview, the prime minister expressed his fears about finding a good state school. He told the newspaper: "I've got a six-year-old and a four-year-old and I'm terrified living in central London. "Am I going to find a good secondary school for my children? I feel it as a parent, let alone as a politician." Last year the Eton-educated prime minister pledged to send his children to state schools - as long as they offer a good standard of education. He told the Daily Telegraph: "I would like my children to go through the state sector. I'll always do the right thing for them." Mr Cameron's six-year-old daughter, Nancy, already goes to a state primary school. The prime minister also has a four-year-old son, Elwen, and his wife, Samantha, is expecting another child in September. He said the coalition government was trying to ensure there were more good schools with their plans for "free" schools set up by parents and others. "In some parts of the country, there isn't a choice of good schools. 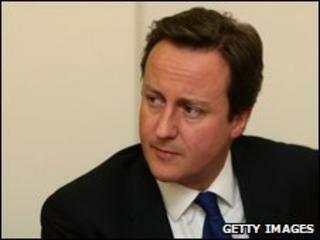 That's why people break the bank to send their children private," said Mr Cameron. Westminster City Council responded to the prime minister's comments, assuring him that its schools are "delivering first-rate education every day". In a statement, it said: "We are proud that several of our secondary schools are considered outstanding by Ofsted and that our nearest primary schools to Downing Street are also both rated outstanding. "We acknowledge that there is still room for improvement and will continue to strive to build on our success to date." Last week Mr Gove announced that more than 700 school building projects would not go ahead, saying the scheme had been plagued by "massive overspends, tragic delays, botched construction projects and needless bureaucracy". The prime minister said the decision was necessary because of the financial "mess" left by Labour and its failure to be open about where cuts would fall. The announcement also attracted criticism because the Department for Education's list of 1,500 projects which were either going ahead, being axed or being reviewed contained 25 mistakes. Mr Gove was forced to apologise to schools which had been wrongly informed.